Among other things, the company's latest production target for its Model 3 sedan changes up the odds of a major 2018 capital raise. Outside of its valuation, perhaps the two most common points of criticism among Tesla (TSLA - Get Report) bears are the EV maker's cash-flow profile and history of missed deadlines. And Tesla's fourth-quarter delivery report -- or rather, the part of the report covering Model 3 deliveries and targets -- provided fresh grist for both of those talking points. That doesn't necessarily make the report's Model 3 info catastrophic, however. What it does do is heighten a pair of 2018 risks Tesla had already been facing: The risk that the company will need a major cash infusion before the year is up, and the risk that Tesla will see Model 3 reservation cancellations increase meaningfully. On the afternoon of Jan. 3, Tesla reported 29,870 total Q4 vehicle deliveries -- up 9% sequentially and 27% annually, and nearly on par with consensus analyst estimates. Deliveries for the high-end Model S sedan and Model X crossover respectively totaled 15,200 and 13,120, beating consensus estimates of 13,800 and 12,200. As a result, Tesla's total 2017 Model S/X deliveries came in at 101,312, beating prior guidance of 100,000. Model S and X sales may have gotten a boost from fears that the recently-signed tax reform bill would eliminate a $7,500 EV tax credit (it was ultimately kept in place), as well as from the pending end of a referral program that provided free unlimited Supercharger network access to Model S and X buyers. 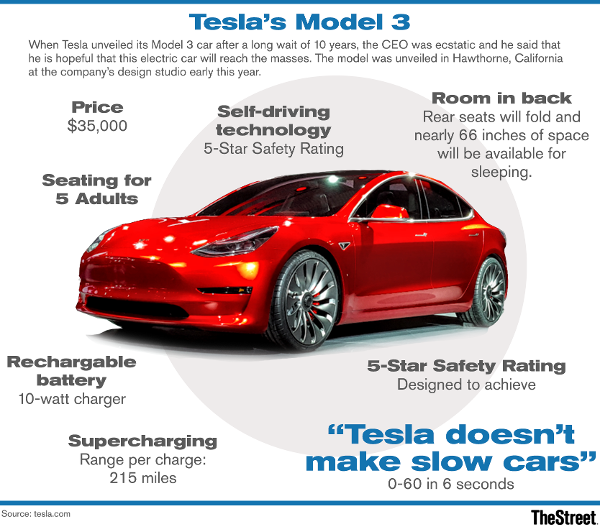 Also, Tesla has been eager to note the attention given to the relatively cheap Model 3 sedan has boosted awareness of, and interest in, the Model S and X among high-end affluent consumers. That's the good news. The bad: Model 3 deliveries only totaled 1,550. While up from 220 in Q3 (the first quarter to see Model 3 deliveries), that figure was well below a consensus of 4,100. In addition, Tesla, which in early November pushed back a goal of producing 5,000 Model 3 units per week from the end of Q4 to "late Q1," now says it will "likely" end Q1 with a Model 3 production rate of about 2,500 units per week. The company is now aiming to get to 5,000 units per week by the end of Q2. Its long-term goal is to reach 10,000 per week, but backtracked in November from promising to get there by the end of 2018. After initially seeing larger losses in response to the Model 3 news, Tesla shares closed on Jan. 4 down 0.8% to $314.62. They're now 19% below a September high of $389.61, but still up 39% from where they traded a year ago. One Model 3 silver lining: Unit production totaled 2,520 in Q4, outpacing deliveries by 970 thanks to an end-of-quarter pickup in output. Tesla notes it produced 793 Model 3 units during Q4's last 7 working days, and (amusingly) notes it "hit a production rate on each of our manufacturing lines that extrapolates to over 1,000 Model 3's per week" during the last few days of the quarter. That sort of fits with data arriving earlier in December suggesting Model 3 output was improving a bit. In November, Elon Musk had blamed Model 3 production woes on battery module assembly issues. There was no mention of those issues in the Q4 delivery report; Tesla did assert the pace of its Model 3 ramp is affected by a decision to "focus on quality and efficiency rather than simply pushing for the highest possible volume in the shortest period of time." Regardless of the specific causes, a slower-than-expected Model 3 ramps stands to worsen Tesla's near-term cash burn, since much of that cash burn stems from assembly plant and battery Gigafactory capital investments (done in large part to support Model 3 production) that are happening regardless of how many cars Tesla delivers (and thus collects payment on). And that ups the odds of a big 2018 capital raise. Tesla ended Q3 with $3.5 billion in cash, $540 million in restricted cash and roughly $10 billion in debt. And on average, analysts polled by FactSet estimate the company burned through $907 million in cash in Q4. For 2018, Tesla is forecast on average to burn $1.98 billion. That figure is up sharply from $772 million at the end of October thanks to Model 3 production challenges, and could rise further still in the coming weeks thanks to the Q4 delivery report. With Tesla also expected to burn cash in early 2019 before finally turning cash-flow positive, and the company presumably wanting some funds on hand to maintain a cash cushion, a 10-figure stock and/or debt offering by year's end seems increasingly likely. Should Tesla go the debt route, it's worth noting the $1.8 billion debt offering it carried out last August featured a somewhat high 5.3% yield. Separately, one has to wonder how many of those who possess Model 3 reservations that -- based on the reservation holder's position -- are unlikely to be fulfilled in the short-term feel tempted to cancel and get their $1,000 deposits back. Considering Tesla had 455,000 Model 3 reservations as of late July and that this number grew in Q3, the company's revised production targets suggest quite a few reservation holders won't see deliveries before 2019...even if there are no more target push-outs. But for now at least, the risk of mass cancellations doesn't feel especially high. The deposits are equal to less than 3% of the Model 3's $35,000 starting price, and as Jefferies analyst Philippe Houchois pointed out while defending Tesla, no rival automaker has something comparable to the Model 3 (when considering its price, performance, handling, range, Autopilot system, etc.) in mass-production or close to it. It's also worth noting that Model 3 reservations featuring relatively short delivery times continue to sell on eBay (EBAY - Get Report) and elsewhere for healthy premiums. Confidence that most would-be Model 3 buyers will stay patient, together with solid Model S/X sales and the moderate improvement seen in Model 3 production towards the end of Q4, are likely the main reasons Tesla shares only fell slightly in response to the delivery report. Though it feels fair to say that the report further lowers Tesla's margin of error for what's shaping up to be a very important 2018, bulls and bears seem to once more have two very different sets of takeaways about info that Musk's company has shared. This column originally appeared on Jan. 4 on Real Money, our premium site for active traders. Click here to get more great columns like this.